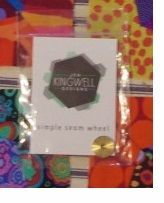 To the left the fabric I purchased a few days ago. So it's between the left one and the middle one. There will be lots of appliqué on the chosen fabric! Like them both , the question is do you want the ground to read pink or white? That I still don't know Wannabee. I thought the white might be too light? 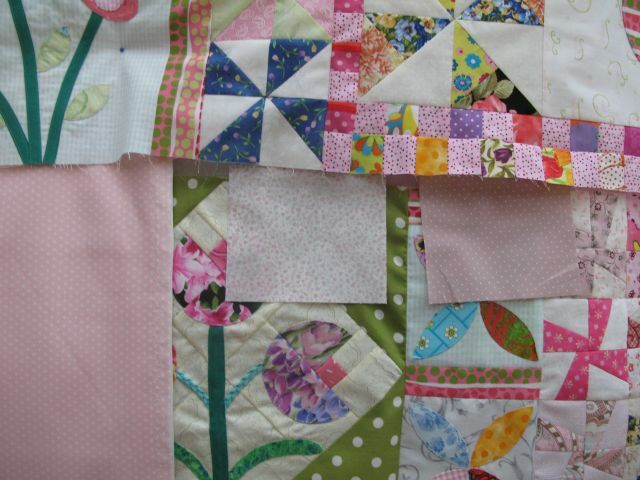 Because most of the quilttop reads pink, but that also could be a reason to use the white one as borders. But this one is a bit out of my comfort zone too as it doesn't have white background so I might continue that and take the pink as border. I guess I have to think about it for a little longer. I like the pink - mostly becuase there is a lot of background that already reads white to me - with the blocks you have shown. I like how the pink seems to pull them together. And even though it's dots, it seems to blend more into a nice background while the white with the small print reads speckled, so it find it a bit more distracting as a background. However there will be reasons you'd want to select the white specifically because it does have more movement than the pink - so it all depends on the look you are going after. "lots of movement" does end up on the edge of my comfort zone. 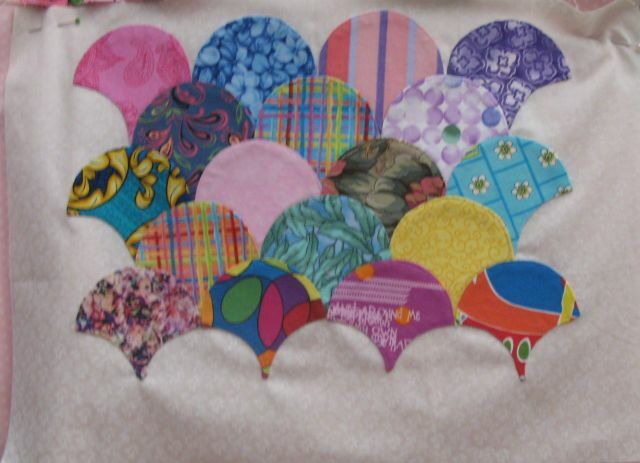 And that is why the Delilah quilt is way out of my comfort zone, but I am liking it so far. 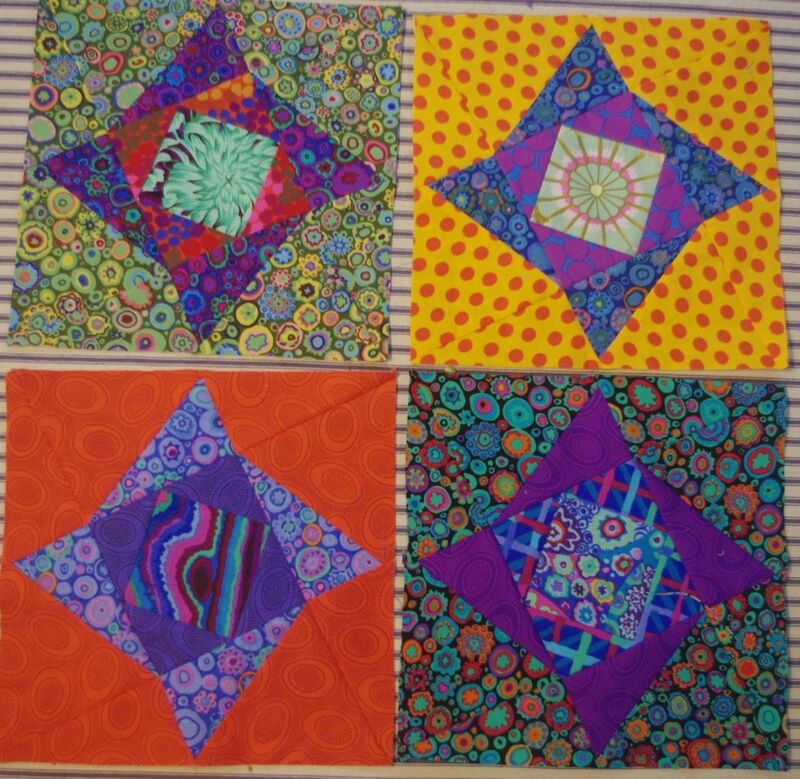 The next set of 9" blocks. These had a lot of Y seams. The little wheel in the center is great for marking them. Does not matter what angle the sides are coming together at, you can always line it up to mark the point. I use a very fine tip marker. It's permanent, but the mark is so small it won't be seen on the front. I'd probably use a washable marker if I had one with a fine enough tip to fit in the center hole. I enlarged it - so you can actually see it lol! 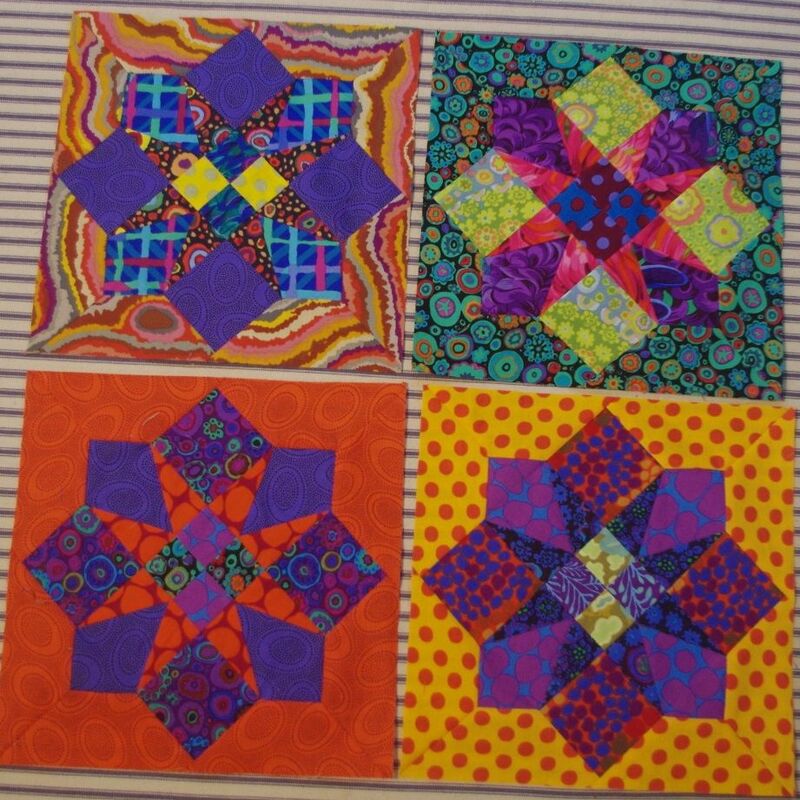 I don't think I need more movement in the quilt. Because of the appliqué I think the fabric needs to blend into the background like you said. For my GTSB border, I chose the color of the checkerboards for balance...black and white, which resulted in White BG and black dots. If I recall, your checkerboard is pink so that is what ai would go for.....but a light one like the middle. Applique should pop on that. I still need to do almost all of section 3 and one block of section 4 so there's time to think about it. OK, patience. Why decide now when we can procrastinate till later. 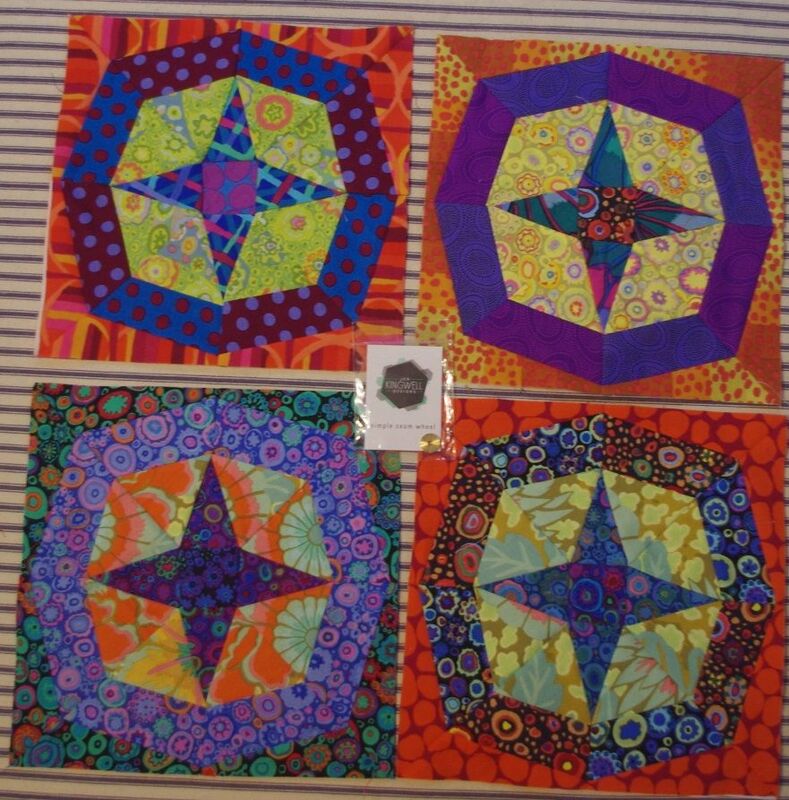 here is another set of 4 - 9" blocks. One more set of 9" blocks and I'll be moving to the 6". They are in sets of 9 blocks. I'm very happy that the remaining set is rather simple, no Y seams! I think I may pull out my design wall and see what these look like all together. Oh yes please!!!!!!! They're all stunning, can't wait to see them together!! Please Macy take a picture so we can drool. 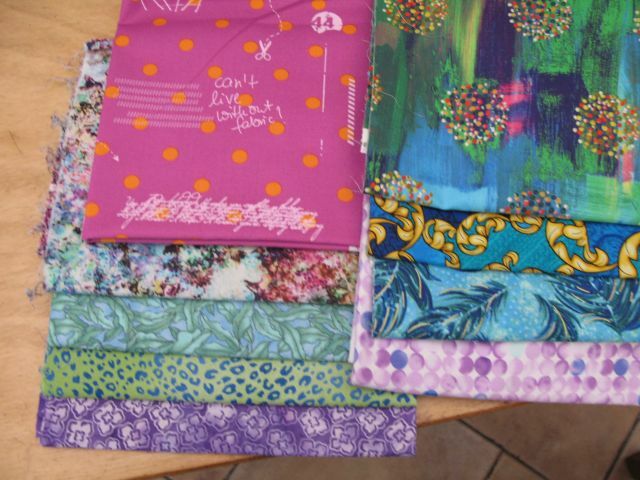 My new fabrics arrived. I forgot what I ordered so it was a nice surprise!! OK Anael, i have to ask for a picture? Yes, let's see pics of new stash, please!! Will take it when daylight has arrived Still dark here, 7.45 am now. Teen I thought you were going to do Happy Birds? Or are you waiting with that project till your house is sold? and these I haven't decided yet. Just like them! Working on the Clam Shell block for GTSB. I don't like this kind of appliqué! 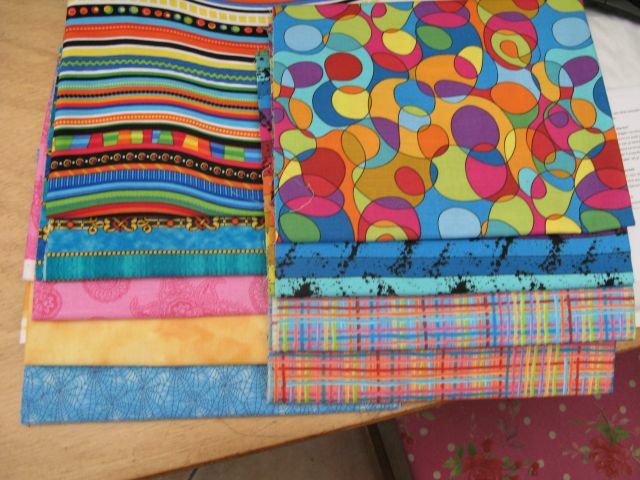 Those are some pretty fabrics! I finished up the 9" blocks. Got started on the first set of 9- 6" blocks (there are four sets) this one has curved seams so it's going to take the longest. The others are less work. DH and I are going to spend the day bumming around. He's pretty excited. Maybe these curved seams aren't as hard as the double drunkards path. 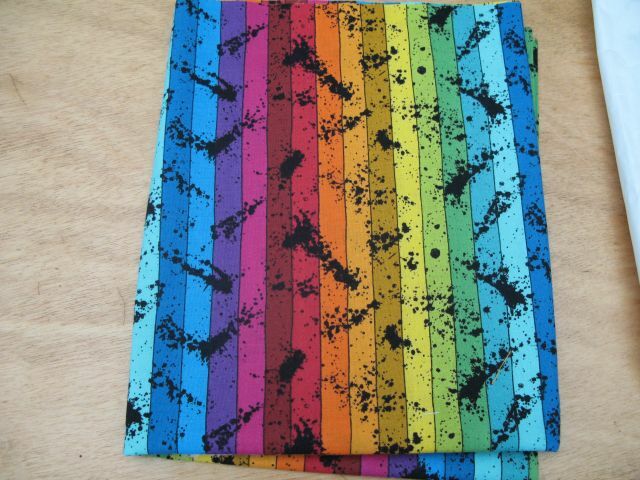 Pretty fabrics!! The writing on the pink is hilarious... I'm not going to start Happy Birds yet until everything else is done. 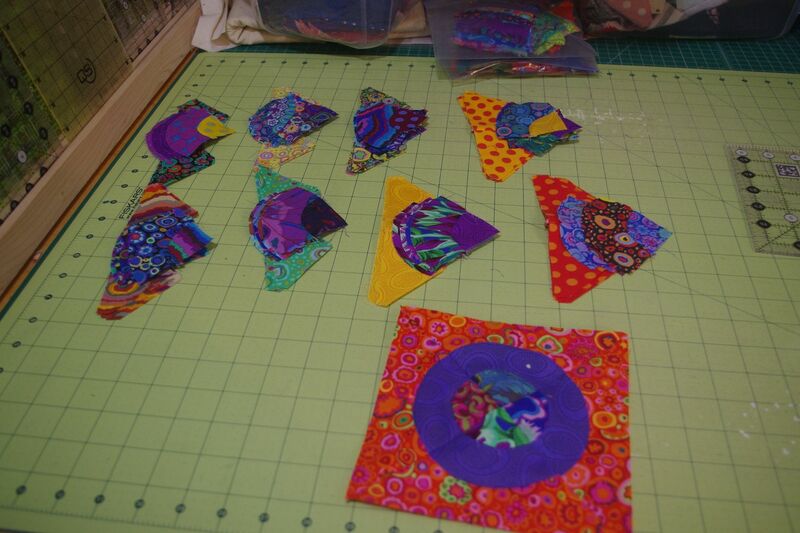 I'm working on Christmas projects and a sundry of other stuff...so it will need to wait.